The geeky requirements are meant to ensure the best brew at home, though often we over complicate a task that usually needs to be done before you are completely awake. Lists and recommendations for brewing coffee at home also seem to add up to a stack of equipment that may cost a small fortune by many household standards. So today we will begin a series of articles about finding coffee brewing equipment on a budget, starting with the ~$50 range. Please note that we will assume you are buying good, fresh, whole beans (hopefully based on our ratings!) and this cost is not accounted for in our $50 budget, since coffee will be an ongoing cost. If you are unsure where to even start, you should read our 5 Tips for Better Coffee at Home article to see what to prioritize first. On the $50 budget, grinding can be difficult but not impossible. You will be using at least half of your budget on the grinder. There are a number of models available, both electric and manual. We really recommend saving your cash for a better (also, more expensive) grinder if at all possible, as it will last longer and you will really see a huge difference (as well as grind considerably faster than the manual options). These are burr grinders as we do not recommend the spinning blade style of grinder. If you can’t justify the cost, or are saving your cash for a better model, then you should get your coffee ground as freshly as possible at a local specialty cafe. Once coffee is ground the flavor and intensity begin to degrade. The longer it has been ground, the more bland and flat it tends to taste, and after a while it can even develop taints in flavor due to absorption of odors. The very basic hand grinder. Small, lightweight, and easy to carry. Takes a bit of time to grind, but great for travel! A solid hand grinder with a glass base. It grinds a bit faster than the Mini Mill and feels more substantial. Grind particles at a larger grind tend to be less consistent. An entry level electric burr grinder. This will have a reasonable grind consistency, but if you must have an electric this is your best bet for the price. If you get those 20% off coupons from Bed Bath and Beyond you might consider using one for the Capresso Infinity to get a slightly better version for a similar price. We certainly wouldn’t buy an electric grinder that costs less than this. This is where you have a lot of freedom in your purchasing. From the trendy to the time tested to the least expensive option, you can certainly find an option here. Once again, quality electric brewing machines are hard to come by in this price range so most of our recommendations are for some level of manual device. It is easy to get a cheap plastic “pour over” drip cone, but you should see a better brew quality with the ceramic models due to their ability to retain the heat of the water when you brew. A standard glass french press. Does not use filters, but has a sediment in the cup that can be unpleasant to some coffee drinkers. Great for making a larger amount of coffee. An old design that has proven itself. This brewer relies on special thicker filters that slow down the brew water. Chemex brand filters are a necessity for this brewer. Coffee filters are another cost in your brewing and, while they are typically inexpensive and easy to come by, some styles or brands may cost much more than others. Remember when buying a particular brewing method that it may need special filters which are made specifically for that brand. Chemex, Aeropress, Hario, and Kalita (not on this list) all use filters that are not always readily available at a local retail store. Contrary to common belief, the quality of the paper in your filter can have a big impact on the brew quality. Thicker material tends to be better, and we always recommend using plain white filters and never brown “natural” ones as they consistently add a wood-like paper flavor to the brew. Our recommendation for the standard #2 or #4 cone filter is the Melitta brand. A good quality at a good price, usually $2-$3. If you are going to choose a Chemex, Aeropress, or Hario brewer you will have to find the filters that are made for that particular method (The aeropress comes with @350 filters in the box). While the Aeropress filters are quite inexpensive ($3.50 for 350), Hario v60 and Chemex filters can range from $4-$10 for 100. If you are interested in the Aeropress brewer and would like a sustainable replacement for paper filters, the ABLE disk is a good option. It doesn’t make quite as clean of a cup as paper, but you don’t have to worry about buying filters again. NOTE: There are two options for this filter! Fine and Standard. Make sure you get the proper one for your coffee needs. If you are unsure, the Standard filter is your best bet. For an added bargain, Able sells the Aeropress brewer with the metal filter for $40, which is a couple bucks less than buying them separate. So you have all of the previous steps covered? A gram scale is a good idea to make your coffee a bit more consistently. It can be used for simply weighing out your beans (or grinds), or measuring your whole brew if you are using a manual brewer. While the best scales are a bit more money, there are a couple of weighing options that work in this price range. A small pocket scale. Great for weighing beans or small brews, with a number of useful options. Shows the weight to 1/10th of a gram. A solid and reliable scale, with the option to use 3 AAA batteries or an AC cord. Measures in 1/2 gram increments. A large surface scale. Can be used for coffee or food with good accuracy. Up to 11lb capacity, measuring in whole grams. If you are going to buy a manual brew method where the water needs to be poured over the grounds, a water kettle can really help improve the quality of your coffee. They also give you control to pour water where you want to without a mess. More expensive versions have heating elements and a base to heat water either to boiling or a specific temperature. That said, kettles can be expensive and a bit of a luxury, especially considering that they have a specialized, single purpose. To pour hot water over coffee grinds. The following kettles can be either filled with boiling water, or placed on a hot plate, stove, or flame to heat water inside if desired. One of the most affordable water kettles. Simple and effective, with a good capacity for water. Well known and attractive. The Hario kettle has a lower profile, which can be desirable for some users. Made in the USA, with a narrow spout for very controlled pouring. Great if you want to fine tune how you pour the water over the grinds. This is not a comprehensive list of every product on the market in these price ranges, however these are products that we recommend for their quality and cost. We did not find any quality products at a significantly lower price. In addition, you may be able to find slightly lower prices by shopping around. The prices listed may have also changed a bit since the posting of this article. 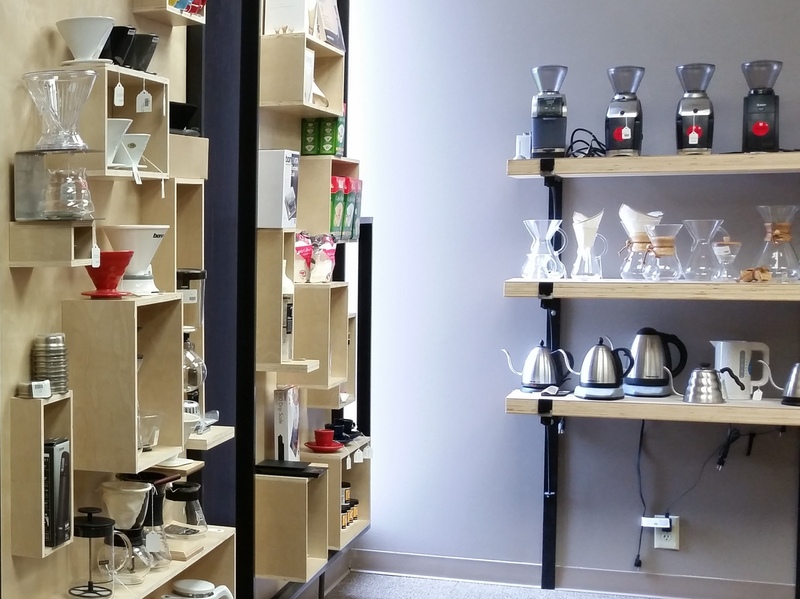 $50 is a difficult price range to get a full coffee brewing setup in. As usual, getting everything you want to make amazing coffee is a tough challenge. We do recommend 1) a hand grinder for a temporary grinding solution (which would still come in handy if you travel or go camping), or 2) buy coffee fresh ground in a cafe in small quantities (1-3 days worth is ideal) as a first priority for better flavor. If you start here and get one or two solid items for brewing, your next steps (if you want them) in refining your morning cup will be much easier.